Palm Leaves Press, 9781941529140, 196pp. This new translation of the Buddha's most important, most studied teaching offers a radical new interpretation. In September, 2014 Thich Nhat Hanh completed a profound and beautiful new English translation of the Prajñaparamita Heart Sutra, one of the most important and well-known sutras in Buddhism. The Heart Sutra is recited daily in Mahayana temples and practice centers throughout the world. This new translation came about because Thich Nhat Hanh believes that the patriarch who originally compiled the Heart Sutra was not sufficiently skillful with his use of language to capture the intention of the Buddha's teachings—and has resulted in fundamental misunderstandings of the central tenets of Buddhism for almost 2,000 years. 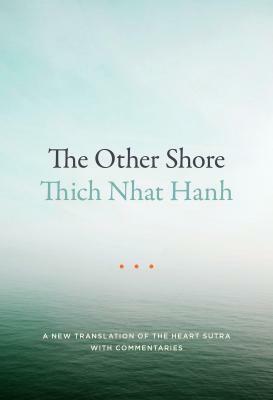 In The Other Shore: A New Translation of the Heart Sutra with Commentaries, Thich Nhat Hanh provides the new translation with commentaries based on his interpretation. Revealing the Buddha's original intention and insight makes clear what it means to transcend duality and pairs of opposites, such as birth and death, and to touch the ultimate reality and the wisdom of nondiscrimination. By helping to demystify the term "emptiness," the Heart Sutra is made more accessible and understandable. Prior to the publication of The Other Shore, Thich Nhat Hanh's translation and commentaries of the Heart Sutra, called The Heart of Understanding, sold more than 120,000 copies in various editions and is one of the most beloved commentaries of this critical teaching. This new book, The Other Shore, supersedes all prior translations.